As the house is coming to completion, I wanted to write you this letter and let you know that I am most grateful and blessed to have had you as the Architect and Contractor. You did a wonderful job. You worked within my budget and I could not have done this project without your knowledge and guidance. Much thought went into the design and detail. The quality and workmanship is excellent. I cannot believe that it was completed so quickly and no problems. 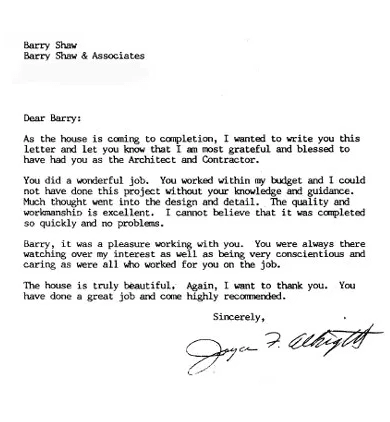 Barry, it was a pleasure working with you. You were always there watching over my interest as well as being very conscientious and caring as were all who worked for you on the job. The house is truly beautiful. Again, I want to thank you. You have done a great job and come highly recommended.